Each spring and fall for the past eight seasons, USA Hockey has introduced the sport to more than 153,000 kids ages 4 to 9 through Try Hockey For Free Days. Participants gather at hundreds of local rinks, don free hockey gear and take part in introductory hockey sessions that teach basic skills under the watchful guidance of USA Hockey-certified instructors. Afterward, they get opportunities to register for teams or additional development programs. The 2018 Try Hockey spring session will take place March 3 as part of Hockey Weekend Across America, an annual celebration geared toward hockey lovers of all ages. The timing is especially noteworthy for another reason, as it follows on the heels of the Olympic Winter Games in PyeongChang, where the U.S. Olympic Women’s Ice Hockey Team captured gold. This has been a regular practice in each Olympic year since THFF’s inception, explained Kevin Erlenbach, USA Hockey’s assistant executive director of membership. The Try Hockey For Free program began with a few rinks taking part, but has grown steadily each year. 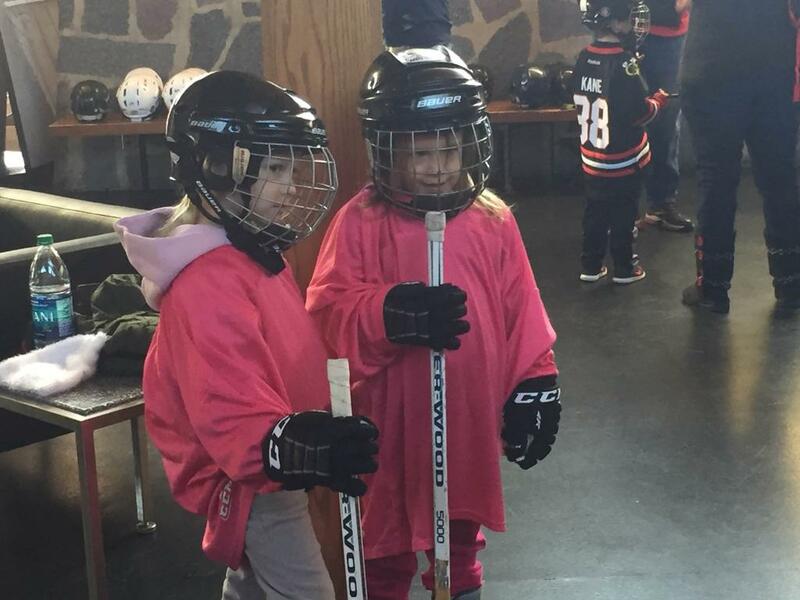 Last November, 451 rinks hosted THFF Day, in conjunction with Come Play Hockey Month. Approximately 400 locations have signed up for the March 3 session. Some of the biggest concerns USA Hockey addressed with parents early in the Try Hockey initiative was the cost of equipment and level of commitment. If they were going to invest in a full set of gear, and spend weekends at the rink for several months out of the year, they wanted to make sure hockey was the right fit for their son or daughter. During the THFF session, kids are provided with a bag of equipment to use, along with a free jersey they can keep. A volunteer is assigned to each participant both on and off the ice. After check-in, the first thing each volunteer shows his or her assigned player is how to dress and lace up the skates. This is an important part of the process, especially for a child who has never tried to stand up or balance themselves on ice skates while in pads with a stick in their hands. Erlenbach calls this experience “second first steps,” comparing it to a child taking his or her first baby steps, then gradually learning to walk on his or her own. Kids are divided into stations according to age and physical development to learn basic fundamentals. Coaches run through skating techniques, carrying the puck, and shooting. Players are then given the chance to put what they’ve learned into practice with cross-ice games before being provided with information on signing up for a local team or development program. USA Hockey puts a premium on safety, knowing this is another concern for parents. As Erlenbach points out, hockey is a much different game than it used to be, even in the NHL. Once young athletes and their families express interest in making a commitment to hockey, especially following an event like Try Hockey For Free, the next step is to keep them loving the hockey experience. For more information about Try Hockey For Free, visit the Try Hockey website and enter your zip code to find a rink in your area.